National Parks are very special places. We’re thankful that Congress in 1872 could actually agree on something and vote to make Yellowstone the first National Park. When the Park Service was created in 1916 as a result of the National Park System Organic Act, it was defined as such, “The fundamental purpose of the parks is to conserve the scenery and the natural and historic objects and the wildlife therein and to provide for the enjoyment of the same in such manner and by such means as will leave them unimpaired for the enjoyment of future generations.” As a kid, I remember the struggle in Michigan to establish the Sleeping Bear Dunes area as a National Park. Such animosity and acrimony. But, I’m thankful that Senator Phil Hart and supporters prevailed. If this gorgeous area had not been protected as a National Park, I probably would never have been able to experience this magnificent shoreline. It would all be held in private hands and be more playgrounds for the privileged. If you’ve never been there, put it on your Bucket List – it’s spectacular. OK – back away from the soapbox, Judy. 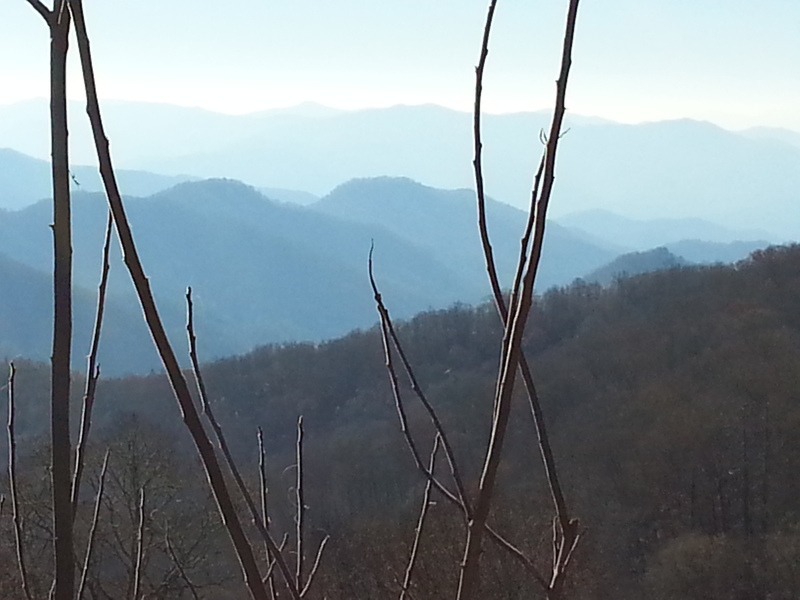 We decided to head to Great Smoky Mountain National Park upon leaving Tanglewood. 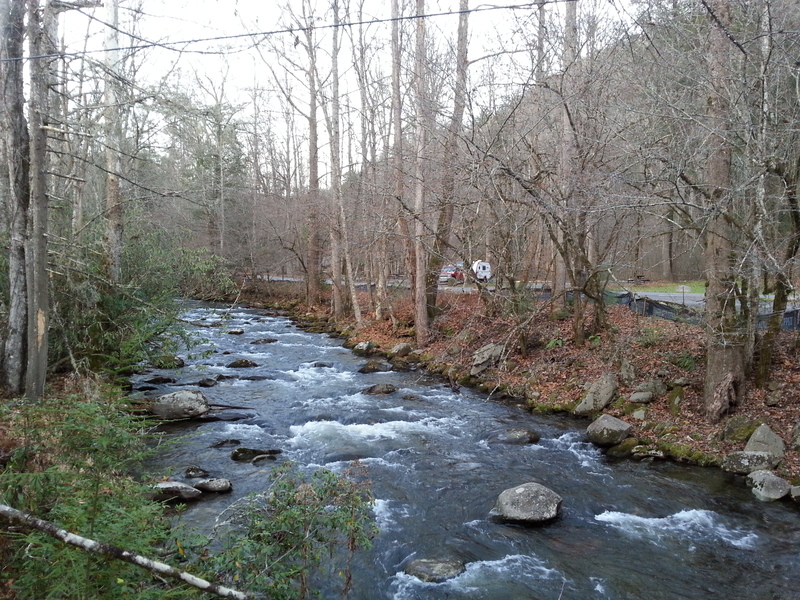 Only three campgrounds are open at this time of year, so we decided to spend two nights at Smokemont, the easternmost of the open areas, then cross to Cades Cove in TN. That would give us the opportunity to drive through the entire park, and camp in two distinctively different areas. After the pampering we experienced at Tanglewood, we were ready to rough it at Smokemont. Byebye warm bathrooms and and hot water. See ya electricity. Say hello to campfires! This is the kind of camping we love. We are masterful gatherers of firewood, scrounging firepits where prior campers have left perfectly good firewood for us, and heading off into the woods for kindling. It’s almost a sport to see who can drag the biggest, most unwieldy piece back to camp. At Smokemont, we nabbed a spectacular site, right alongside the roaring river. Only three or four other campsites were occupied, so none of us were even within shouting distance of each other. Perfect. We hiked the Smokemont Trail on Tuesday, leaving Jezzy snoring on the bed, guarding the Fireball as only she can. Our six mile stroll included about two miles of ascending up a path, two miles of descending, and a nice two-mile stroll alongside the river. 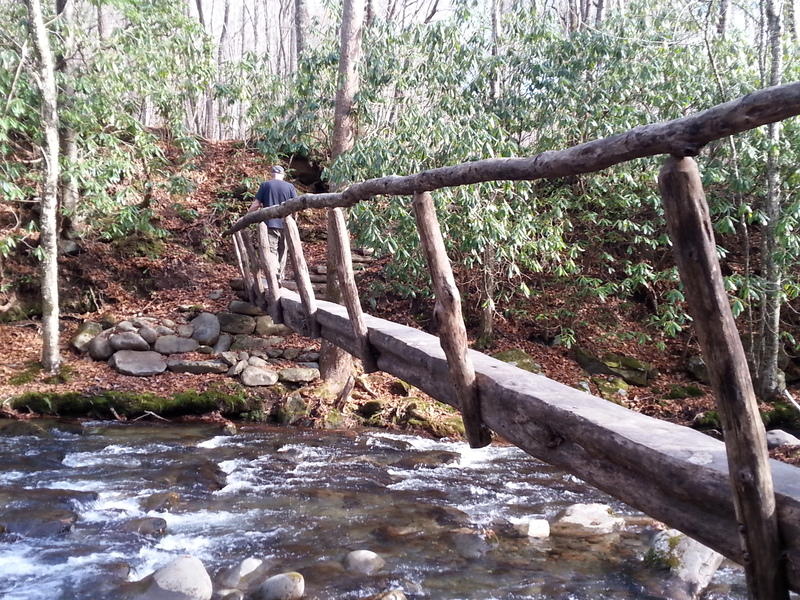 The abundance of rhododendron along the Trail made us want to revisit in Spring when they are in bloom. It must be spectacular. There was a bit of a hairy crossing of the river, so we were happy that Jezzy wasn’t with us. Not sure if we would have been able to get her to walk the plank or not. 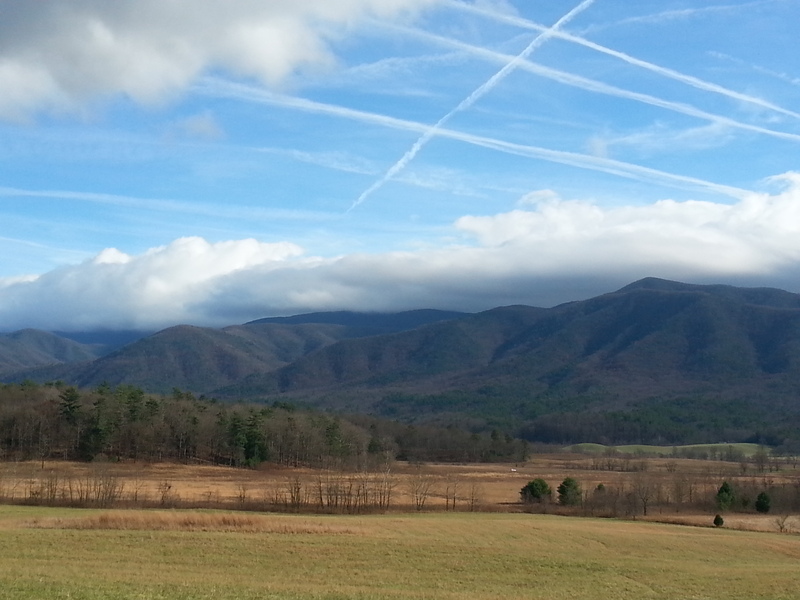 After two nights, we packed up and moved to the SW corner of the Park to Cades Cove. 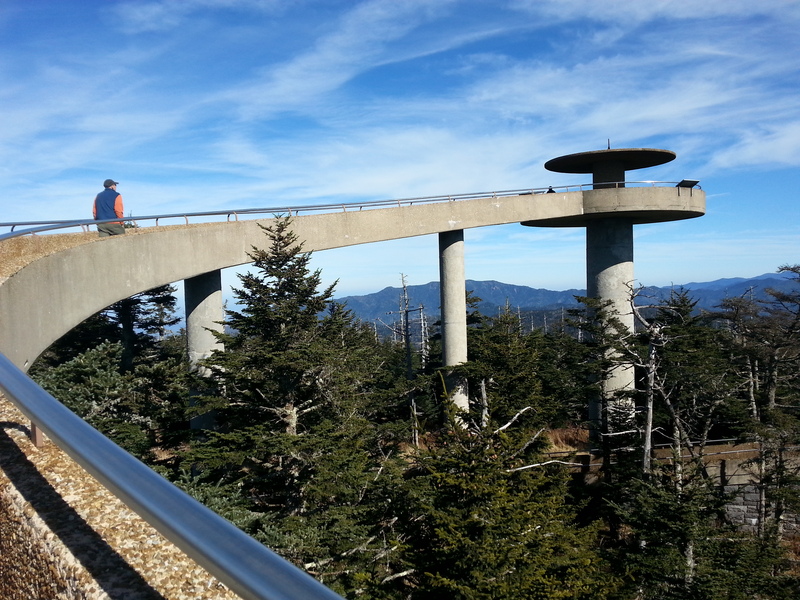 Along the way, we stopped at Clingman’s Dome, the highest point in the Park. 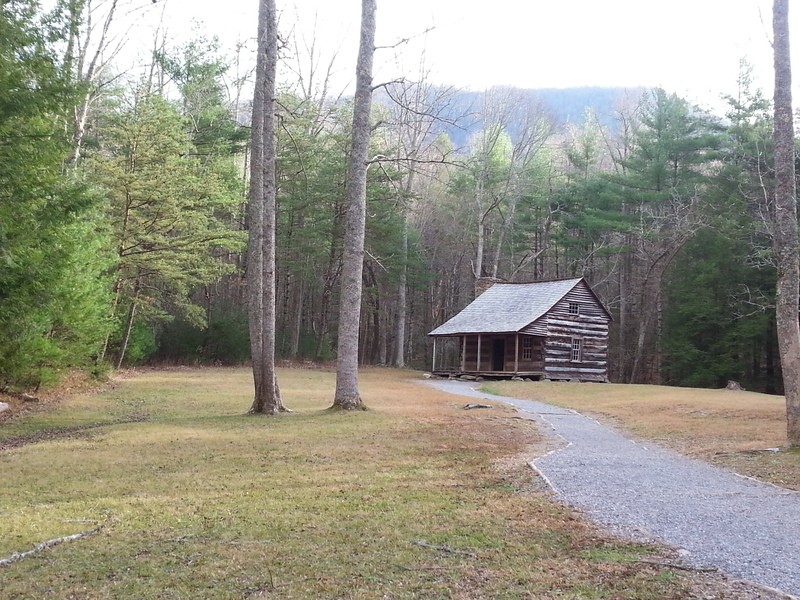 Cades Cove has two campground loops. Again, there was no competition for a prime spot. We stayed in the B loop, along with two other campers spread out in 80+ sites. We did have to hike a bit for water, (to the dump station in the other campground) as they had the outside water faucets turned off, but that was hardly an inconvenience compared to the beauty (and silence) of our campsite. We couldn’t even see other campers. We had enough water on board to use our shower and do dishes, and fresh water from the campground for drinking and making coffee (our #1 requirement is good coffee). 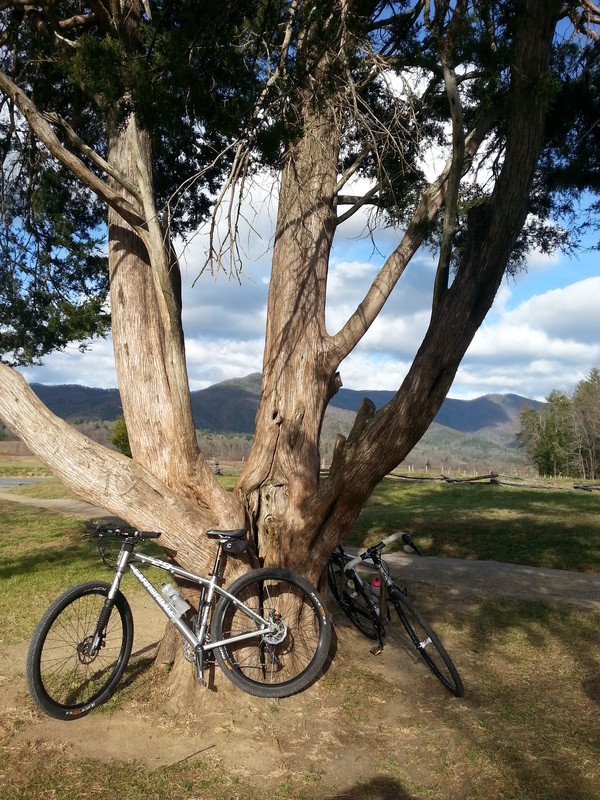 This area of the Park features an 11 mile paved scenic drive, wide enough to accommodate bicycles, cars, and RVs. Cycling the scenic drive was pure pleasure, as there was so little traffic that we didn’t have to put our lives in our hands to enjoy a great rolling ride. 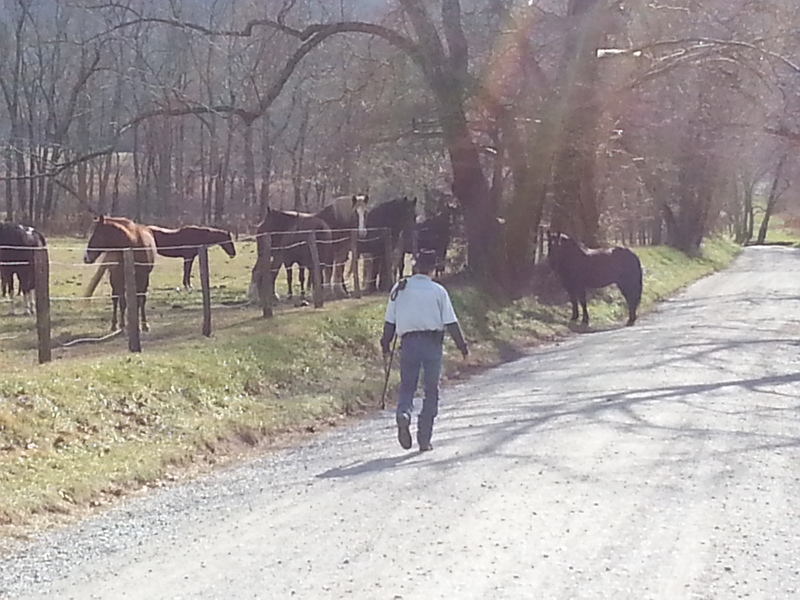 Near the horse stables, we watched a cowboy wrangle an escapee horse back into the corral. 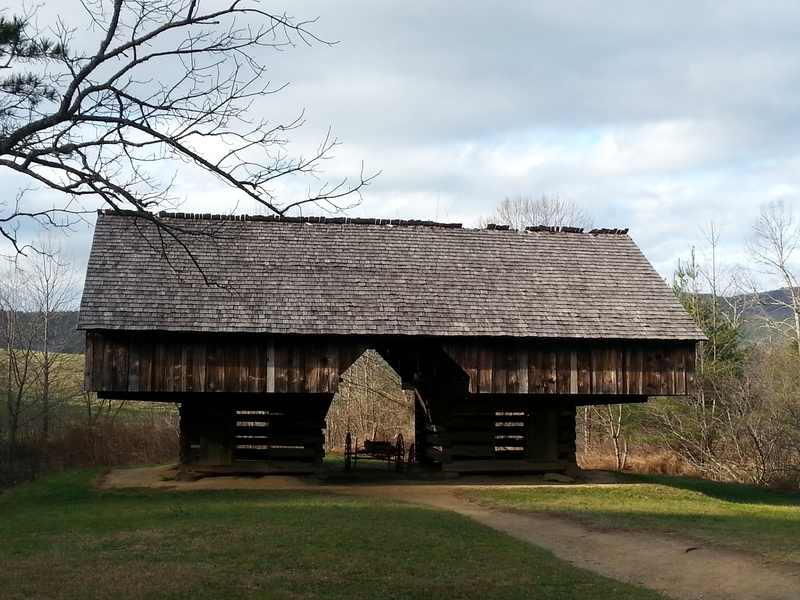 Explored all the historic log houses and churches, stopped at every scenic lookout, and amazed the cars along the drive by reaching the same lookout points as they did, in roughly the same amount of time. It’s sad that so many people see an eleven mile bike ride as an unattainable challenge. Packing up to head home on Friday was sad. 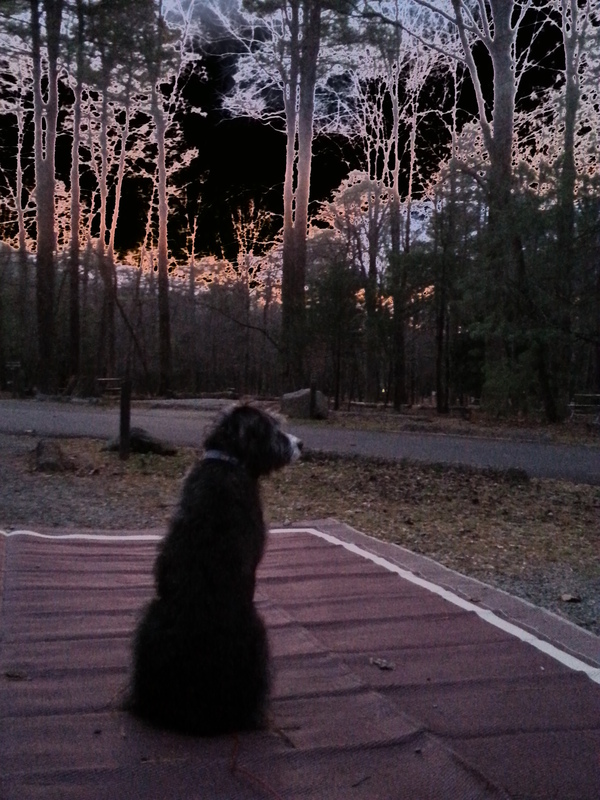 We knew cold weather lay ahead, but decided the Cesar Woods SP near Dayton would be a good stopping-off point for the trek back to Michigan, with its promise of electric hookups, bathrooms and showers. Uh, not quite. We did have electricity, so we could run our little heater. But the bathrooms were locked (there was one portajohn), and there was no water anywhere. Fortunately, we had refilled our two gallon jugs for coffee. We were close enough to Dayton to actually get Verizon signal for the first time in five days, so we could use our phone and tablets while trying to keep warm with our little electric heater. We like to suffer a bit, and refuse to actually make the Fireball warm inside. 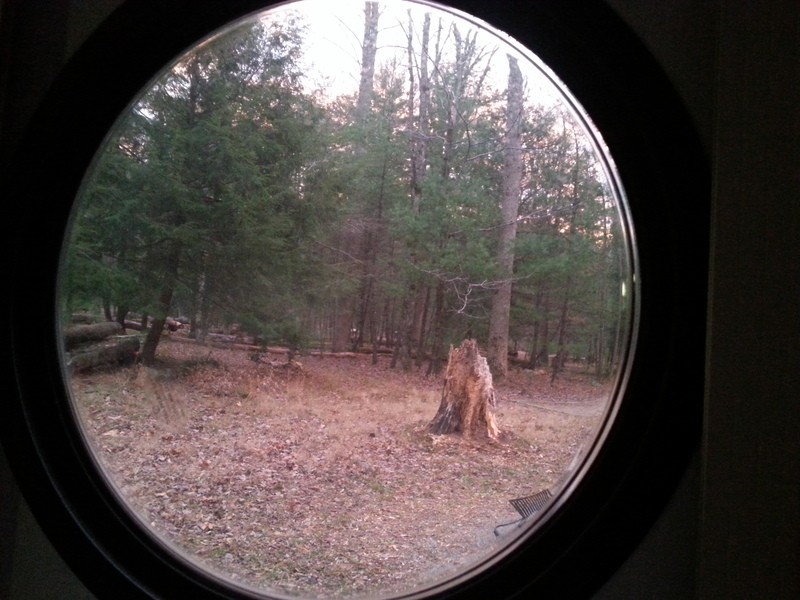 After all, we’re camping…..
Saturday morning, we had to winterize the Fireball before hitting the road. Temps in the 20s, along with big winds and low windchill temps made that a necessity. Work done, we hit the road, finding a few big snow squalls along the way, and very brisk temperatures. Back home, we’re pleased to find that the water heater still fires right up, and the refrigerator kicks back on. All good until next time…. 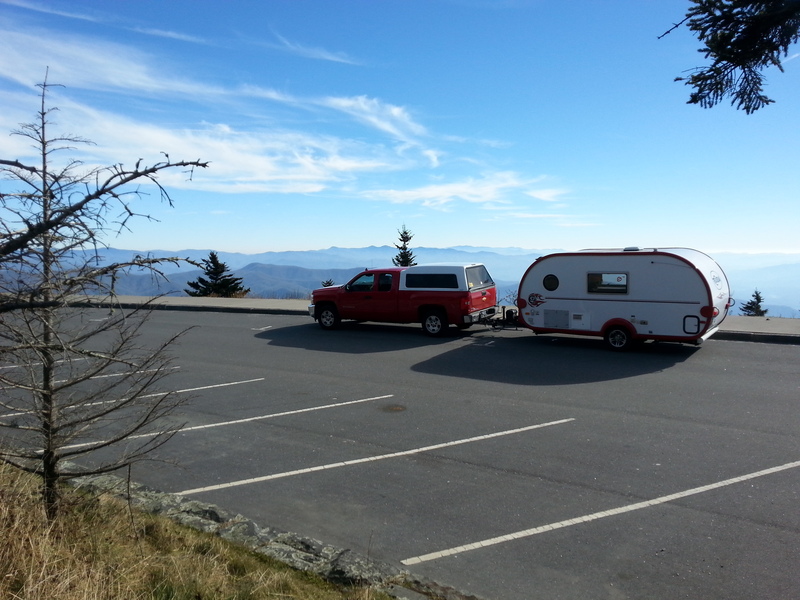 This entry was posted in attractions, camping, cycling, great outdoors, hiking, national parks, North Carolina, retirement, simple camping, T@DA and tagged camping, cycling, hiking, historic sites, national parks, retirement, road trip, simple camping, T@DA, the great outdoors by Judy Crankshaw. Bookmark the permalink. Great post on one of my favorite places! 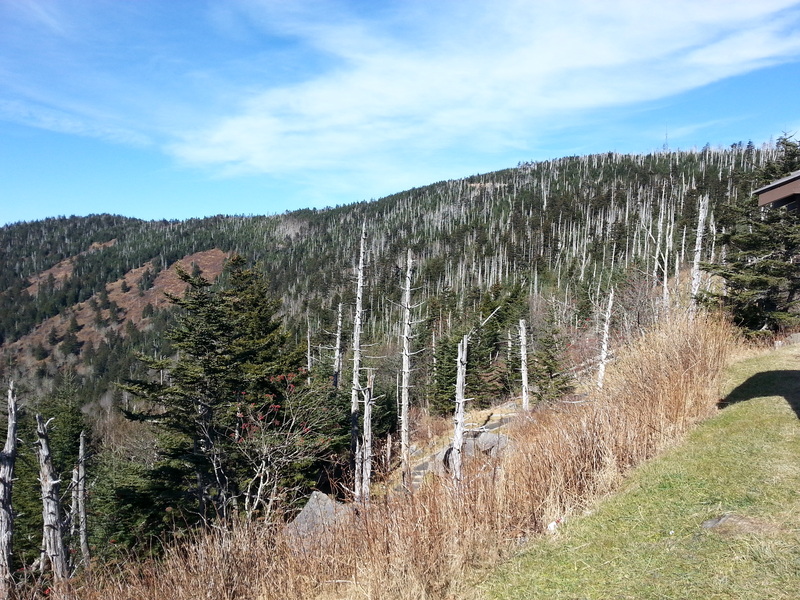 The smokies are wonderful in all seasons. The wildflowers in April are magnificent! We plan to visit in the spring, but it sure is wonderful to be there when nobody else is! Having your own personal National Park is something we could definitely get used to! I wondered how you were doing in the cold weather after your last post. 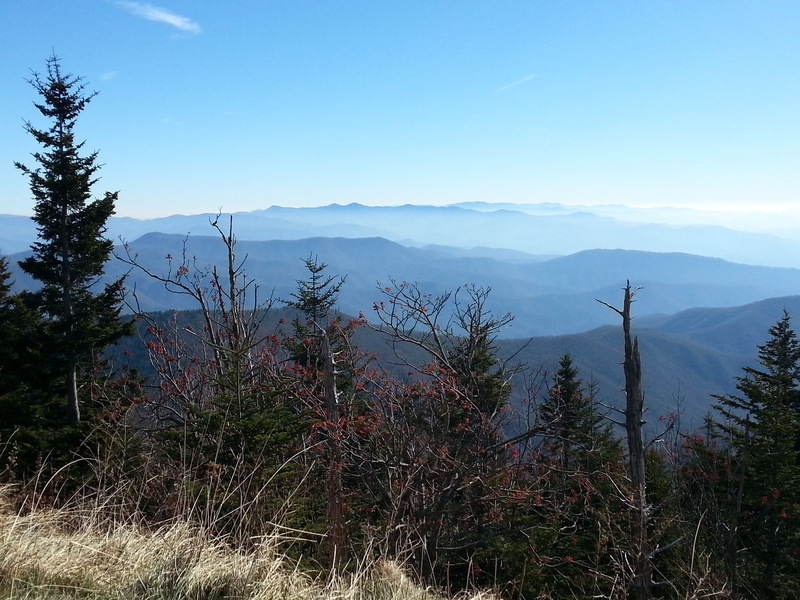 It’s amazing how beautiful the Smokies are this time of year. 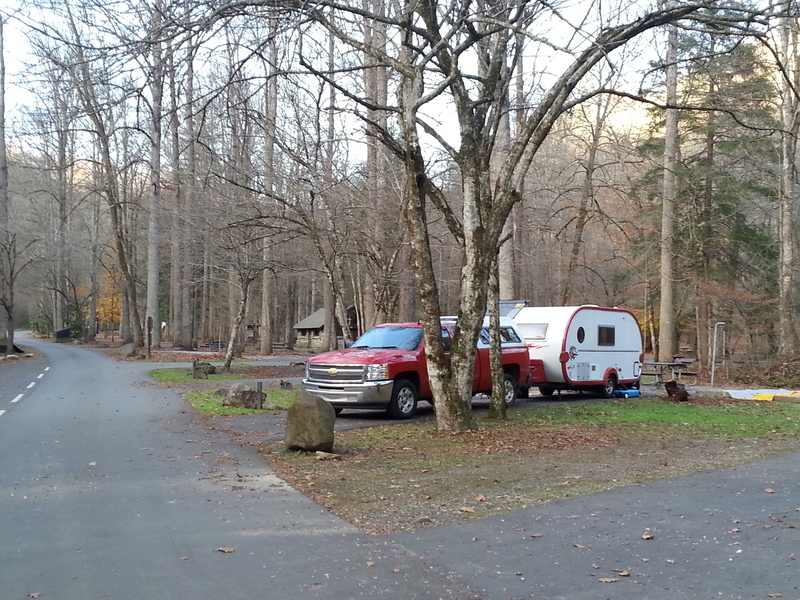 And how wonderful to not have the crowds in the campgrounds! We do pretty well camping in the cold. It’s especially nice when you’re somewhere that allows you to build a huge roaring campfire every night. Waaaay less fun without that! Great scenery! I’m glad that you had such nice weather and accommodations for your vacation, coming home must have been a shock. Shock is the polite word for our feelings on the weather today. ;-) Jezzy likes it, though…. It’s sad and lonely, putting our dear trailers away for the winter. 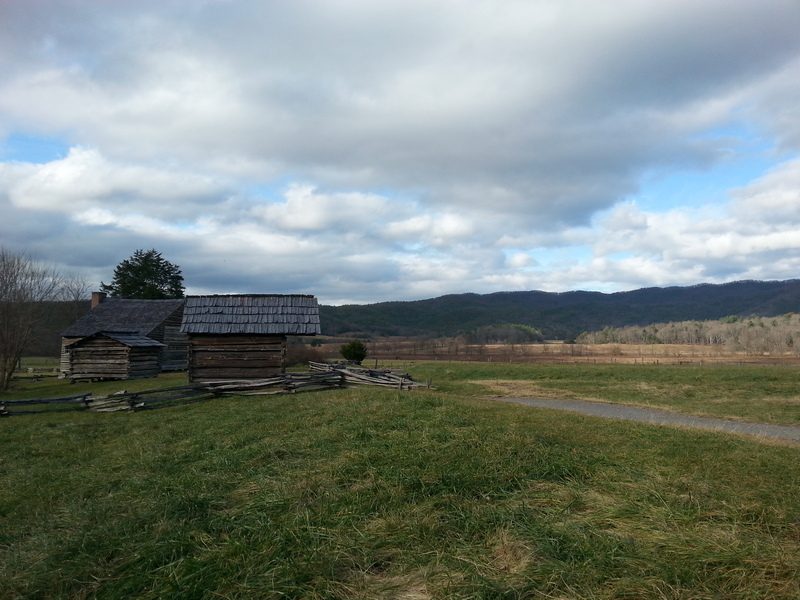 I’m really excited about our first trek out next season to Cades Cove! We’ll be at Big Meadow where the river runs fast and full of trout! John will be dreaming all winter! Glad you are back and Fireball won’t freeze! Maybe we can sneak out a day early and join you in Big Meadow. Will keep you posted…..
You were probably there when the Fraser Firs were all still alive – we learned that the beetle that killed them off was introduced around 1970. Still a wondrous place, though. Glad you’re back home safe.